It’s been a rough couple of weeks for Daisy. The vet couldn’t figure out why she kept gnawing on her rear right paw. After shaving back the fur, she couldn’t find evidence of foxtails or thorns. But she saw the skin was really red. 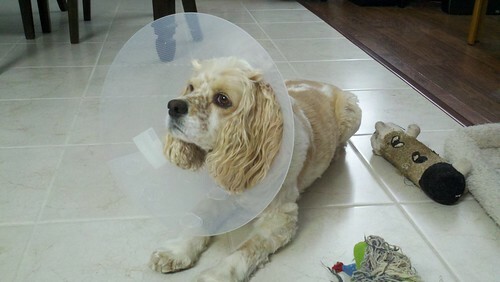 So – Daisy had her paw bandaged up for more than a week. We kept her on a steady diet of antibiotics. We wrapped wheat bread slices around her pills. Today, the vet gave us the green light to remove the bandage. Her paw looks better and Daisy wanted to welcome it back with more chewing. So, she had to wear the cone of shame this morning.